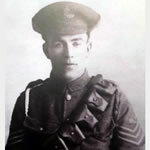 During the precursor bombardment to the Battle of Arras, on 5 April 1917 Gosling was a battery sergeant in charge of several heavy trench mortars. A bomb was fired from a Stokes Mortar from Sergeant Gosling's battery. "Owing to a faulty cartridge the bomb, after discharge, fell 10 yards from the mortar. Sergeant Gosling sprang out, lifted the nose of the bomb which had sunk into the ground, unscrewed the fuse and threw it on the ground, where it immediately exploded. This very gallant and prompt action undoubtedly saved the lives of the whole detachment".